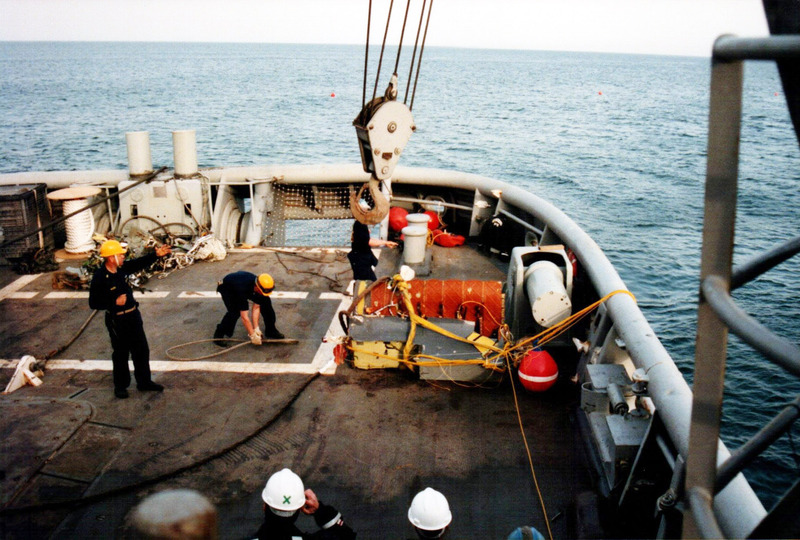 MISAWA AIR BASE, Japan (April 27, 2001) -- The USS Safeguard, a Navy salvage vessel, continues to conduct salvage operations off the shore of Ripsaw Range, approximately 10 miles north of Misawa. The U.S. Navy ship is conducting operations for the F-16 aircraft that crashed April 3 into the Pacific Ocean, after training at the range. After nearly two hours underwater, U.S. Navy Deep Sea Divers were able to rig a portion of debris from the F-16 aircraft that crashed into the Pacific Ocean April 3. The piece is a portion of the aircraft's fuselage. The Safeguard is anchored about 1000 yards from the shore. Navy deep sea divers have conducted underwater searches for aircraft debris. Later, divers go back to these sites, and depending on the size of the aircraft debris, will rig the piece so it may be pulled back onto the Safeguard. To date, found wreckage includes the jet engine, some fuel storage tanks, wing sections, portions of the fuselage, various portions of the aircraft's instrumentation, the gun barrel and part of the gun system assembly. In order to minimize the environmental impact by fuel or oil release during recovery, both absorbant pads and absorbant booms were used to contain any possible leakage. Initial recovery plans for F-16 wreckage salvage include recovering the flight/data recorders, the ejection seats, and the external fuel tanks. Most of the wreckage should eventually be recovered.